Cut the lamb intestine into small pieces. Add half teaspoon turmeric powder and 1 cup water. Pressure cook it for 10mins. After cooking remove the water. Heat oil in a kadhai and add mustard seeds and curry leaves. Saute for a while and add sliced onions. Fry till it turns golden brown and add ginger-garlic paste. Add tomato and saute a while. Add turmeric powder, red chilli powder and garam masala. you can also add 1tsp coriander powder to give extra taste. Mix well and add kudal pieces. Cook it covered in low flame for 10-15mins. Since we have pressure cooked it wont take much time to cook. Make sure that there is not much water left. Break eggs in this mixture and add salt to taste. Cook it for 5mins and garnish with chopped coriander. My mom taught me this recipe which i liked very much. It goes very well with rasam rice. My grand-mom taught me how to clean kudal. 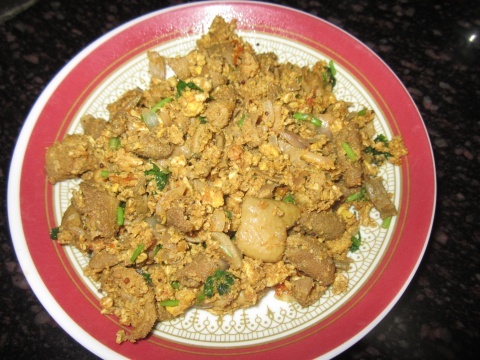 It is time consuming but if you want home made boti recipe then no other way. We have to clean by ourself. But i liked this method. My grand-mom taught me step by step which is very easy to remember. One way is to put kudal in hot water and wait for while. The Waste will get removed but the taste differs. If you clean in cold water it tastes different. Younger lamb kudal will not take much time to cook. The tender flesh will be pink in color.